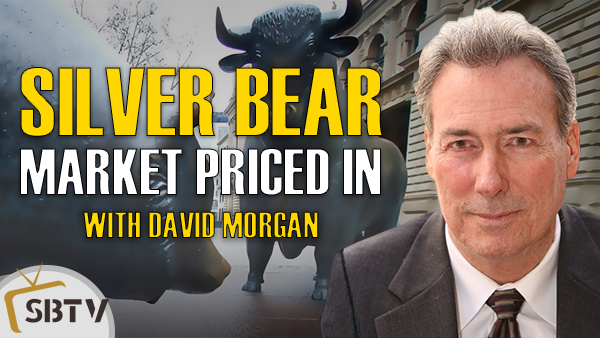 We spoke with David Morgan of the Morgan Report on SBTV to get his take on the silver market at this moment. Is the bear market already priced in the silver price? Being 'gut honest', David believes the risk-reward in silver right now is 'unbelievably tasty' and everyone who does not have a position in silver is making a grave mistake. 03:06 David Morgan's reaction to the Nixon Shock of 1971. 06:31 Chances for the return of the Gold Standard. 10:08 Stock market exuberance a mirage? 12:07 More debt today than in 2008. 17:46 Bottom priced in for silver price? 22:11 Commercials now long in silver. 27:09 $100 silver still on the table? 30:07 What if we are on a Silver Standard? 35:45 Lode coin cryptographic silver monetary system. 38:00 Do cryptocurrencies have intrinsic value?